From tomorrow, every business across Australia will be banned from charging customers excessive surcharges for using certain types of EFTPOS, Mastercard, Visa and American Express cards to make payments. The excessive surcharging ban has applied to large businesses since September last year and now extends to all businesses that are either based in Australia or use an Australian bank. The ban does not affect businesses that choose not to apply a surcharge to payments. “The good news for consumers is that businesses can now only surcharge what it actually costs them to process card payments, including bank fees and terminal costs. For example, if a business’s cost of acceptance for Visa Credit is 1.5 per cent, consumers can only be charged a surcharge of 1.5 per cent on payments made using a Visa credit card,” ACCC Deputy Chair Dr Michael Schaper said. 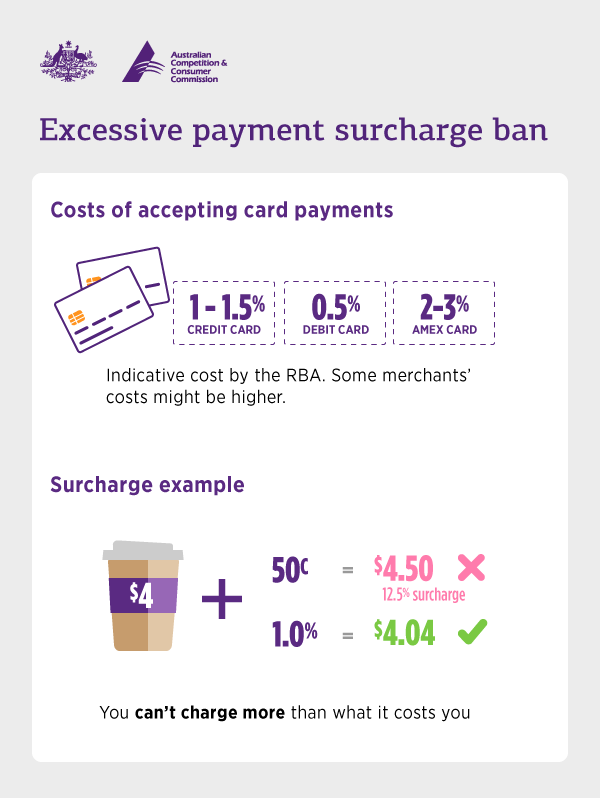 If businesses want to set a single surcharge across multiple payment methods, the surcharge must be set at the level of the lowest cost method, not an average. For example, if a business’s cost of acceptance for Visa Debit is 1 per cent, for Visa Credit is 1.5 per cent, and for American Express is 2.5 per cent, the single surcharge would be 1 per cent as that is the lowest of all payment methods. Businesses should have received merchant statements from their financial institutions in July setting out their cost of acceptance for each payment method. The RBA indicated as a guide that the costs to merchants of accepting payment by debit cards is in the order of 0.5 per cent, by credit card 1-1.5 per cent and for American Express cards around 2-3 per cent. The ACCC has found that some merchants have incurred higher costs than these but any surcharge level imposed by merchants cannot be higher than the costs incurred by them for accepting that payment method. “If businesses are unsure about their cost of acceptance, they should contact their financial institutions,” Dr Schaper said. The ACCC has published online guidance material for businesses and consumers. The ACCC has been given new powers to enforce the ban. A surcharge will be considered excessive where it exceeds the permitted cost of acceptance, as defined by the Reserve Bank of Australia. The RBA’s website also provides detailed information for businesses about the Standard, including how businesses can identify and quantify those costs that can be passed on to a consumer as a surcharge. Payment types that are not covered by the ban include BPAY, PayPal, Diners Club cards, American Express cards issued directly by American Express, cash and cheques.